Here is where my portfolio stands on the end of November. It has been hard to accumulate any gains in my portfolio because investors are switching from higher yielding stocks like consumer staples and utilities into areas that will benefit from the Trump administration, like industrials. I hold the majority of my stocks in consumer staples since they are the most reliable dividend growth companies. The investment philosophy I follow is relatively straight forward. I only invest in high quality businesses which is determined by their economic moat, their large scale presence, credit rating, increasing earnings consistency, and dividend increase consistency. I also try to invest primarily in non-cyclical businesses. These types of businesses offer products and services people use everyday regardless of the economic situation. These types of businesses help ensure that my dividend increases year after year are consistent. 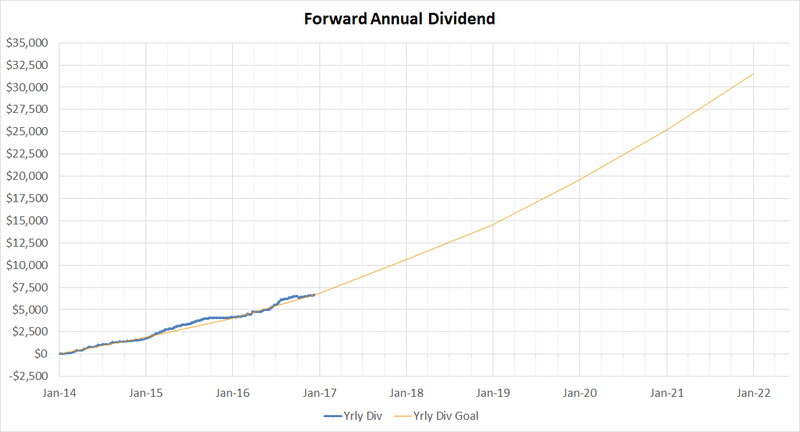 The last thing I want is a decrease in my dividend payout because the company does not have enough free cash flow to sustain the dividends. 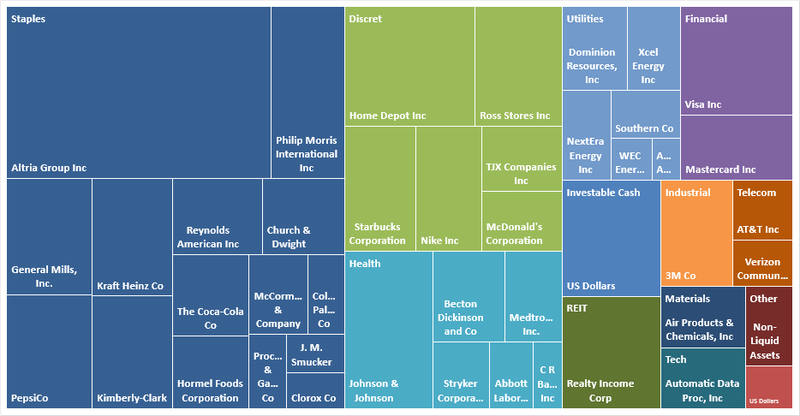 I classify my portfolio distribution into Super Core, Core, Supporting, and Speculative. I believe a portfolio must always have a large Core positions before one starts accumulating Speculative positions. My Speculative positions will rely primarily on capital gains and I may or may not hold them long term. These are more "trades". The Core positions I intend to hold for life and collect their dividends. I also classify my positions into their sector types such as Staples, Utilities, or Financials. I do not hold any Energy since I got pretty burned in the last oil price crash. Learned a lot from it and do not like the cyclical nature of energy businesses. You never truly know what it's like to own a company until you actually own it. My positions in industrials is light and I do not have any positions in Technology besides ADP (which isn't really a tech stock). Most of the rally in the S&P have been with the industrials and tech and I have unfortunately not been able to participate since my weightings in them are light. The reason I do not own much of these is that industrials tend to be highly cyclical. I don't want to purchase industrials at a market top. I don't purchase tech either since most do not offer dividends and have extremely high valuation ratios. I also cannot foresee if most of these tech companies will be around in the next 30 years since tech changes much too quickly. 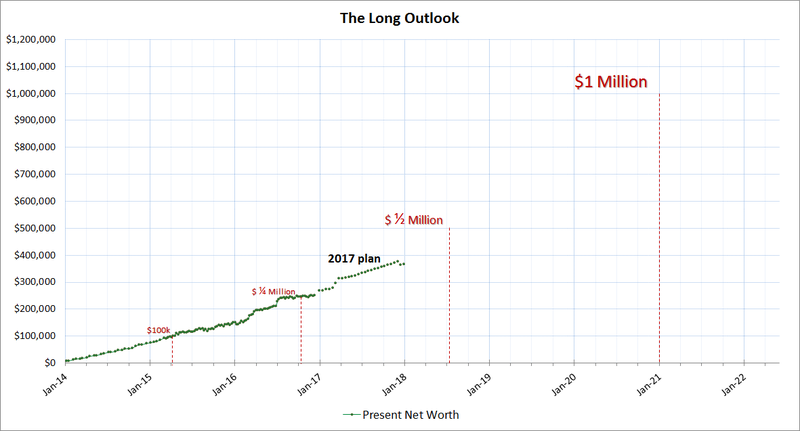 My net worth continues to grow but lately has slowed down. I'm in no rush to achieve my goals. There will always be good times and bad times. My portfolio right now roughly a 1/4 of a million. 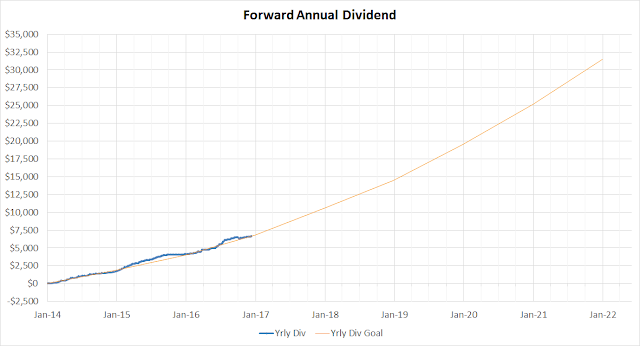 The value is starting to get large enough such that my monthly contributions are quite small relative to the whole value. Daily fluctuations in the portfolio can start to become very large dollar wise. My periodic contributions have recently been used to dampen the losses in my portfolio balance but with little to no net gain. In the past when my portfolio balance was low, my monthly contribution easily cause the total portfolio value to rise. 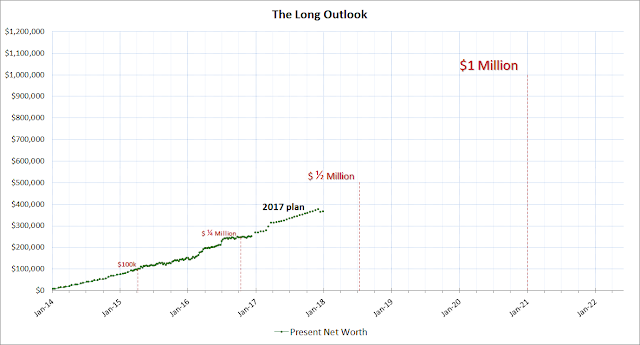 This graph shows how much dividends my portfolio will generate every year. This amount is creeping up steadily and steadily. There are times when it is flat when I decide to hold more cash and times when it ramps up quickly when I deploy the cash pile. Stay tuned for the December and 2016 year summary. VL is Value Line. I look at their safety and financial strength ratings. All the graphs I make myself in Excel. I do not plan to contribute $750k in 4 or 5 years. That's impossible for me. I am hoping my portfolio will experience growth in addition to my contributions. Once your portfolio is over $500k the portfolio starts doing a lot of work by itself. A 10% gain on 500k is 50k increase. If nothing happens I may end up in the $650-700k portfolio value region.